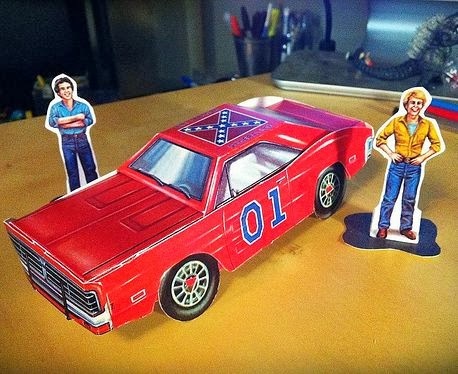 3D models of cars seen in the show including the General Lee Dodge Charger, Daisy Duke's Jeep CJ-7, and Sheriff Coltrane's police car. Miscellaneous 3D accessories including hay bales and a road block. Scans of the book may be viewed at Reis O'Brian's blog. 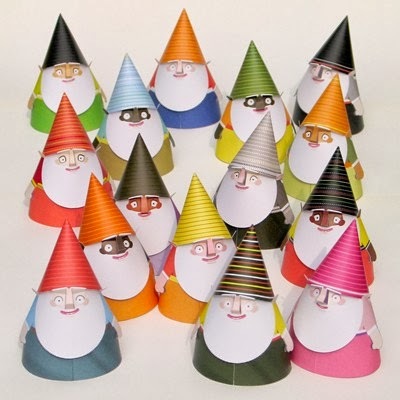 This plethora of gnomes, or I should say "snorfs", is the creation of Maarten Janssens at 3EyedBear. There are fifteen different snorfs in all, each with a unique name. Click on the image of the snorf that you want here to download its PDF template. 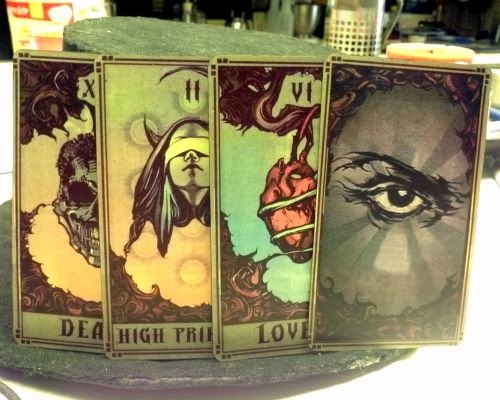 MarkWynn shared with me these printable replica tarot cards based on cards appearing in the movie Now You See Me, a 2013 thriller about a group of four magicians who use their illusion skills to rob banks. Each of the cards has a front and a back which must be printed, cut out, then glued together. For a finishing touch, color the edge of the cards with a black marker. JPG images of the cards may be downloaded here. 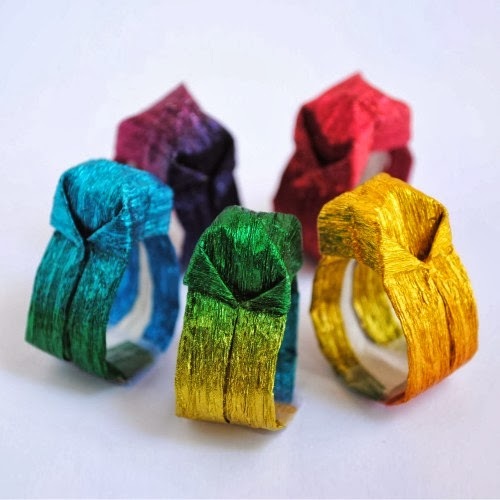 Here are some quick and easy origami rings. To achieve a gem-like look, the rings were folded from metallic crepe paper. Detailed folding instructions for the rings may be found at Zakka Life. Build photo by Jessica Okui. The Ishikawa's frog lives only on the the islands of Okinawa and Amami Oshima in the Japanese archipelago. The frog's distinctive coloration is thought to be camouflage that allows the amphibian to blend into mossy areas beside small mountain streams. 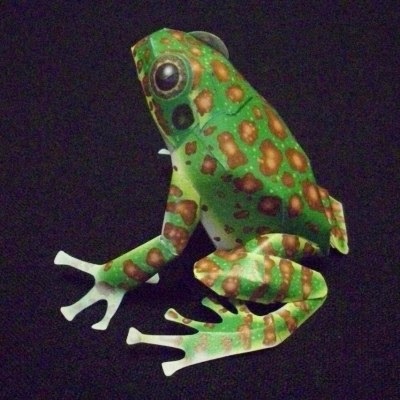 This papercraft Ishakawa's frog is one of several free rare animal paper models offered by Konica Minolta. 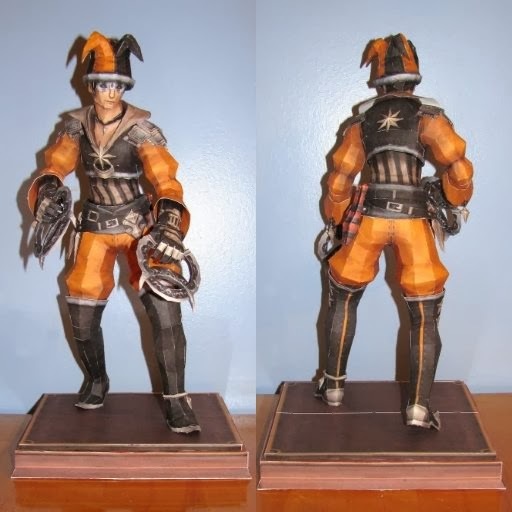 Build photo by DeviantART member Master-Kankuro. 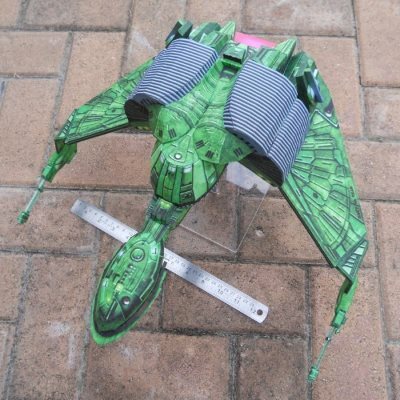 This papercraft Moon Hopper was created for use in miniature gaming. 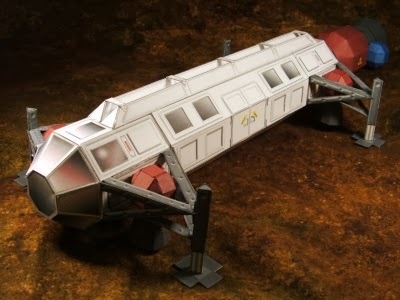 It is similar in design to the Eagle Transporters from the old Space 1999 television show. Magnets allow the modular cargo containers in the middle of the ship to be attached and detached. The PDF template for the Hopper may be downloaded here. Model design and photo are by Tommygun.